Meituan has over 50% of China’s group-buying market in terms of gross merchandise volume (GMV), according to multiple industry reports. At the company’s third annual event earlier this year, Wang Xing, founder and CEO, disclosed that as of 2013 Meituan had 70 million users and 400,000 customers in over 200 Chinese cities. Starting off as a Groupon clone, Meituan is now on its way to becoming the Taobao marketplace of local services. Not only does it have the largest market share, Meituan is also the only independent group-buy service in today’s top players. Dianping, “China’s Yelp” began offering group-buy deals a few months after Meituan’s launch, and has funding and an senior executive from Tencent; Nuomi, the group-buy program initiated by social network Renren, has been sold to Baidu. Juhuasuan is the homegrown group-buy service of Alibaba Group for online retailers on its marketplaces. According to a report by Eguan, a Chinese research firm focusing on e-commerce, as of the first half of this year, Meituan, Dianping and Nuomi had 56%, 21% and 13% of China’s group-buying market, respectively. Meituan’s early competitors, LaShou and 55Tuan, only have a single digit percent share combined. Thousands of group-buying sites emerged in China not long after Groupon got traction in the U.S. Meituan was among the earliest, launching in March 2010. Its first competitors, LaShou, 55Tuan and 24quan were launched in the same month. Eighteen months later, LaShou filed for IPO in the U.S., claiming it was the largest social commerce site in China in terms of unique visitors. But winter would come soon. LaShou suspended its IPO and then its founder left. The majority of Chinese group-buy sites burned out while Meituan kept on going. Back in 2010 and 2011 group-buying sites seemed one of the very few gold mines to tech investors in China. LaShou raised three rounds of funding from July 2010 to March 2011, totalling around US$146 million, according to its SEC filing. 55Tuan raised, according to media reports, more than US$100 million as of September 2011. Dianping announced a new round of funding in April 2011 for its group-buy program which was launched in June 2010. It was reported that the amount was more than US$100 million. Hugely funded sites began to burn money on advertising and expansion across China in early 2011. LaShou and 55Tuan were among the most aggressive. LaShou spent US$50.5 million in advertising in the first six months of 2011 (increasing by 168 times their year-on-year spend). It had 184 sales offices in over 500 Chinese cities as of October 2011. According to the recently published book on the Meituan founder and CEO Wang Xing by Chinese reporter Li Zhigang, Meituan took a very different way in marketing: (1) it bought online marketing instead of offline ad space; (2) it didn’t spend venture money on marketing, at least by July 2012. The Meituan team consulted Guan Mingsheng, former president of Alibaba, who told them offline advertising had little impact on merchants, according to the book. When it came to consumers, Meituan had found that online advertising was more effective than offline. As to why Meituan didn’t spend venture capital on marketing, that was a result of its founder’s experience. Wang had had to sell his first startup for failing to raise the funding they needed. At a press conference in July 2011, Meituan showed attending reporters that US$62 million raised in two funding rounds were sitting on its bank account, with US$12 million received from Sequoia China in 2010, and US$50 million in Series B that had just been completed. In the second half of 2011, aggressive sites such as LaShou and 55Tuan would burn through venture funding and found it hard to raise more to support their expansion. The massive advertising campaign wars between them wasn’t entirely useless, at least informing Chinese consumers about group-buy. Apart from advertising strategy, another major difference between Meituan and its failed competitors is positioning. Most sites were focusing on some categories of physical products, such as cosmetics and apparel, while Meituan has been positioned as a “local life service provider”, targeting the service sector, restaurants, movie theaters, barber shops, karaoke bars, and so on. The gross margins from the service sector are usually lower than physical product deals. Meituan felt there was no way to beat Taobao when selling physical goods online, at discounts or not. Unsurprisingly, Taobao launched Juhuasuan (“aggregating deals”), the group-buying platform for online retailers, in late 2010. To compete with Juhuasuan in physical items, Meituan concluded, you would have to have your own warehousing and delivery operations to guarantee a good user experience. However, 10% of Meituan’s offerings are still physical goods, since it wants users in places where it doesn’t yet offer local service deals to know about the brand. Meituan stood out as one of the leading providers of local service deals. The copycat sites which sprang up across China would become another of Meituan’s advantages. Meituan would find it better to acquire or merge with those sites instead of building teams from scratch in smaller cities. In the meantime, the company built strong management and sales teams. Apart from the charismatic and experienced founder and CEO Wang Xing, Meituan has Gan Jiawei, former vice president of Alibaba, as COO, and Shen Li, former head of Baidu’s maps and location-based services. Several members of the core team are the employees of Wang’s first startup. Some moves of Meituan’s helped build a strong brand; for instance, at the company’s first anniversary, its CEO announced a refund policy where users could get a full refund of unused services after their use-by dates had passed. According to the aforementioned book, Meituan think their business is better executed than Groupon. 1. Groupon’s operating costs are too high. 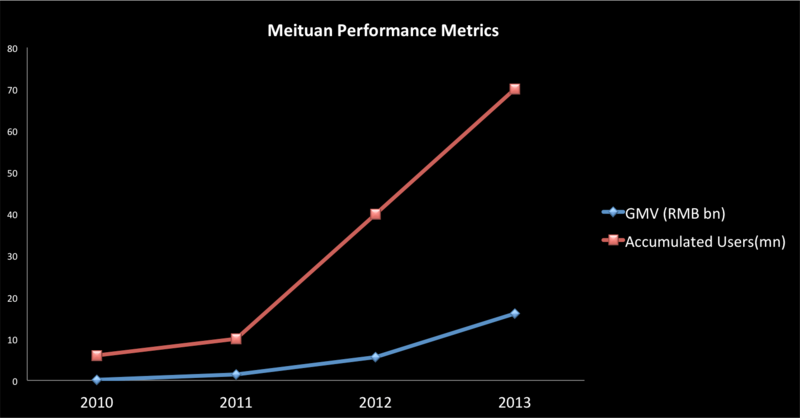 Meituan has been pursuing a low-cost, high-efficiency approach. “Out of quality, speed and cost, you have to comprise one when (your business) is growing very fast. Groupon compromised cost.”…”It’d be hard to cut costs later on”, said its CEO. 2. Groupon enjoys high gross margins with comparatively high prices; Meituan, on the contrary, sticks with low-pricing strategy. Good value for money attracts consumers. Wang Xing is a serial entrepreneur, famous for leading one of the first China’s Facebooks, China’s Twitters, and, more recently, China’s Groupons. Yes, the copycats. But Wang is widely respected in China for he always picked the right one to follow. Xiaonei.com, the pixel-to-pixel Facebook copy founded by Wang, was sold to Oak Pacific Interactive in 2006 (as mentioned above, the team failed to raise more venture money to keep up), and then rebranded Renren.com, which would go public in the U.S. in 2011. Fanfou, one of the first Twitter copies in China, got much traction in the early days but was shut down in 2009 due to interference from Chinese authorities which had found offensive messages circulating on the site. Fanfou would be restored after reaching a settlement with the authorities, by which time Sina Weibo had surpassed it in popularity and influence. Wang thinks group-buy is a new online marketing channel that benefits businesses even more than search engines like Google. Before search engines, only a small number of big brands could afford impression-based banner ads; but as search marketing is more affordable and more effective, smaller businesses who previously couldn’t afford ads on online portals could now advertise effectively. Wang concluded that group-buying is even more effective (as a transaction-based form of advertising) and could benefit more businesses, since search marketing is less effective for local services than for online good/service sellers, he said so at the company’s first anniversary event. Meituan is so far the most successful startup Wang has founded. In 2003, he left his PhD program at a U.S. school and returned to China to pursue entrepreneurship. It is expected Meituan will go public in the U.S. in the near future.